Common to the facial makeup of all character types is the use of eyeliner (sometimes extended at the ends), eye shadow (often in a colour matching with the sampur), “nose shadow” (to make the nose appear sharper) and lipstick. Strong male characters often sport a moustache (usually attached by hooks around the ears) and goatee as well as extra marks around the nostrils and cheeks. Buta (ogres/giants) often have fangs protruding from the sides of their mouths as well as designated areas of white and red face paint. Lulur, a yellow cream, is applied to parts of the body which are exposed in order to achieve a golden appearance. The basic elements of Javanese dance costume consist of the same pieces of clothing found in traditional everyday Javanese dress: kain or jarik (a single, rectangular piece of cloth with bathik design) and setagen (a long, narrow woven cloth sash wrapped tightly around the waist and torso which secures the kain). For dance, the bathik design of the kain must be based on the parang pattern (a recurrent motif shaped like a knife blade arranged in diagonal strips). The kain is always folded in a series of overlapping pleats (wiron) at one end which is worn at the front, while the remainder is wrapped tightly around the hips. Depending on the dance performed, the kain hangs down to the ankles or is folded in half along its length to expose the legs (trousers are worn underneath in this case). The tight-fitting kain allows just enough freedom for the dancer to move but also accentuates the typical flexed position of the knees. For women, sometimes the kain worn is longer than normal to enable the wiron to trail between the legs and behind the dancer as a trail (samparan) that is flicked by the feet. The setagen securing the kain is in fact considered an undergarment and another piece of costume is worn to cover the upper body. For women, this may be a simple kemben (breast-cloth often in a tie-dyed design known as jumputan) or a more substantial mekak (bodice) or kotang (vest). The most elaborate dress for women must surely be the ceremonial dodot which is a very long rectangle of cloth folded in an intricate manner around the body to form pouches and other decorative features. For men, the setagen is covered by a sabuk, a long, thick lined sash which is wrapped in carefully overlapping layers from top downwards. Most male characters are bare-chested but a few wear identifying vests (Gathutkaca wears a black vest with a large embroidered star). 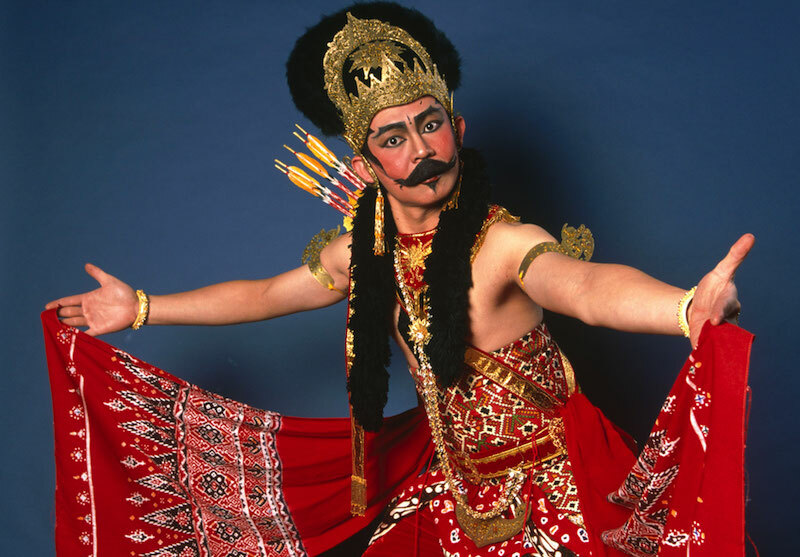 Perhaps the most important piece of dance costume for the Javanese dancer is the sampur, a long sash which is usually attached to the waist by a belt and manipulated by the hands as part of actual dance movements. Gambyong dancers wear their sampur over their right shoulders and male characters from the Mahabharata wear two sampur of different colours. On top of this basic costume, a multitude of other accessories are worn and wielded: irah-irahan (elaborate headpieces essential to wayang characters as they identify who they are by the shape of the crown and hairstyle), jewellery (hair ornaments, earpieces, earrings, necklaces, brooches, armbands, wrist and ankle bracelets), weapons (keris, clubs, daggers, bow and arrows), flowers and other items. If not wearing irah-irahan, women’s hairstyles can be very fancy, often incorporating a sanggul (large bun). Colours are chosen appropriately to reflect the character: green, pink, purple and yellow are suitable for refined characters; dark red and blue are considered strong; white is reserved for clowns and certain characters.